(Oct. 18, 2017) -- Researchers at The University of Texas at San Antonio (UTSA) have begun work on five new research initiatives to enhance clean energy production/integration, improve air quality and reduce greenhouse gas emissions through the Strategic Alliance between the Texas Sustainable Energy Research Institute (TSERI) and CPS Energy, established in 2010. The new projects are supported by Strategy Alliance agreements with CPS Energy totaling close to $1.5 million. Krystel Castillo, TSERI Director and GreenStar Endowed Associate Professor in Energy, is facilitating the research endeavors of these five new projects representing five UTSA colleges. The first is led by Hazem Rashed-Ali, UTSA associate professor of architecture, and includes Professors: Roger Enriquez, John Merrifield, Keith Muhlestein, Francine Romero, Hatim Sharif, and Rob Tillyer, representing four UTSA colleges. Supported by a $500,000 agreement, Rashed-Ali and the team are partnering with the City of San Antonio to address climate change by developing a local plan to improve air quality and reduce greenhouse gas emissions. This new plan involves extensive research into reduction strategies that are working for other cities, community engagement approaches that will build a sense of shared goals, and input from San Antonio’s citizens. The project aims to set local goals for greenhouse gas reduction, further positioning San Antonio as a leader in clean energy initiatives. The second project, supported by a $356,631 collaboration, is an effort to create smart buildings that can actively talk to battery energy storage system and power grids. Researchers will develop a system to gather information about energy consumption, solar energy generation, battery status, occupancy behavior and have buildings operate most energy efficient while maintaining indoor thermal comfort. The project has the potential to reduce customer energy bills, create more stable grid performance and enable the deployment of additional renewable energy initiatives. Bing Dong, UTSA assistant professor of mechanical engineering, is leading this project, which includes Krystel Castillo and Jeff Xu. In the third project, supported by a $199,690 agreement, UTSA professors are working to prevent cyber attacks from affecting smart grids using a forensics-driven approach. Raymond Choo, UTSA associate professor of information systems and cybersecurity, and Paul Rad, UTSA associate professor of information systems and cybersecurity, will lead this effort to track perpetrators of attempted cyber attacks against smart grids. The team will integrate forensics and machine learning-approaches, which will allow the utility to discover the location, cause, perpetrator, time and method of the attack, and facilitate the integration of forensics tools into system that can help the organization recover from a cyber-physical attack. Researchers led by Samer Dessouky, UTSA professor of civil and environmental engineering, are harvesting alternative power from roadways. The team consists of Arturo Montoya, Athanassios Papagiannakis, Hatim Sharif, Amar Bhalla, Ruyan Guo and Shuza Binzaid. This project received $298,881. Dessouky’s team has created two prototypes for the project. The first uses the energetic mechanical strain induced by traffic. The second harvests energy from the heat of the asphalt. Both prototypes have a conversion module that converts energy into a stream of electric voltage that can be stored in a capacitor. The overarching aim of the project is to produce a clean and practical alternative source of power. Finally, students led by Walter Richardson Jr., UTSA professor of mathematics, and Les Shepard, the Robert F. McDermott Distinguished Chair in Engineering, will apply machine learning to improve solar forecasting at the CPS Energy Joint Base San Antonio (JBSA) microgrid. Their goal is to enhance management of solar power generation and energy storage. The project, officially named the UTSA Sky-Imager and received a $113,432 funding, is a low-cost computing and camera system that provides for real-time image acquisition and processing of all-sky images. These are used to forecast intra-hour “ramp” events, which occur when low-level cumulus clouds cast shadows on the solar panels and drastically reduce power output. Accurate prediction of ramp events will allow JBSA to more efficiently manage energy generation, storage, and usage. 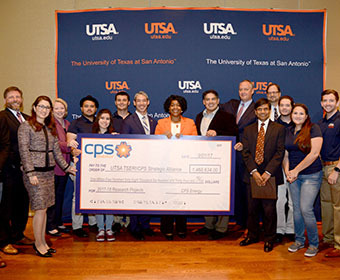 UTSA is also working with CPS Energy on opportunities for internships and employment, with the goal of preparing UTSA students for transition into jobs in the energy and sustainability fields. Learn more about the UTSA Texas Sustainable Energy Research Institute. Learn more about CPS Energy.